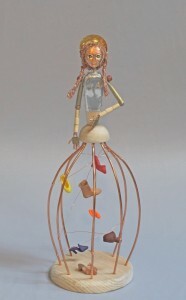 I’ve been working in the studio on some new art doll figure sculptures for several upcoming shows. 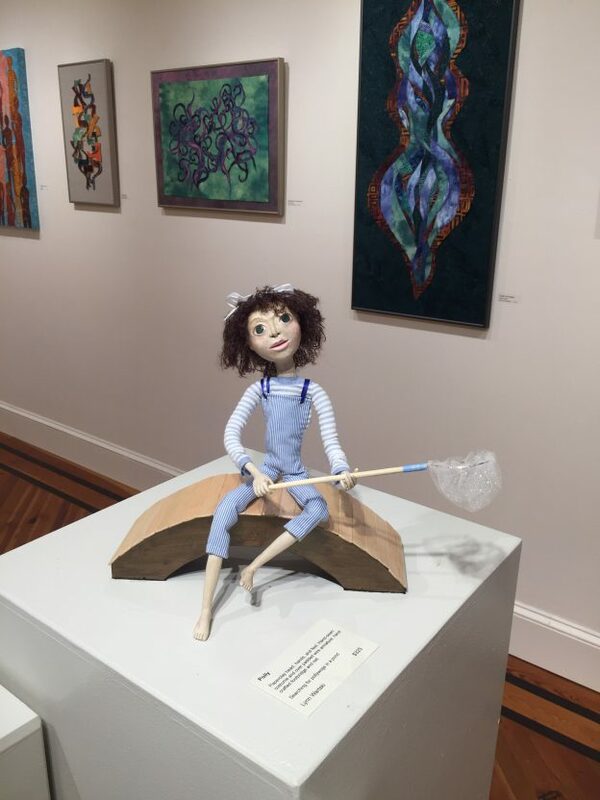 Currently, the Hillsborough Gallery of Arts is featuring it’s yearly North Carolina state-wide juried show Resolutions 2018. This show features non-HGA artists from across the state. It runs through this weekend, so if the snow has melted in your area you have a couple of days left to see it in person. Starting Monday, January 22nd HGA will have C-note. A special themed show of HGA member-artist work all priced at $100. I created two minimalist “figure sketch” sculptures for this show. It was a challenge to create work to a specific price point that still fit within my usual body of work. 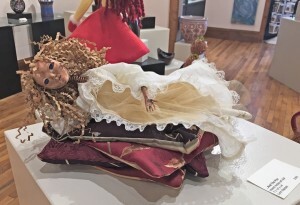 With “Recline” shown below, and her sister piece “Dance”, I’ve paired down the detailed features and costuming of my usual art doll sculptures to their elemental core. Our February opening show will be our yearly “It’s All About the Story” show based on the work of one of Hillsborough’s many noted authors. This year we read “A Broom of One’s Own” by the recently named Piedmont Poet Laureate, Nancy Peacock. I will share a bit more about Nancy, the show, and her author reading in a month or so. For now, I share a peek at “Doris”. The book shares memoir tales of Nancy who supported herself, and her writing as a house cleaner. I decided to bring to life a character that brought together her two disparate occupations. Doris is a member of a hotel housekeeping staff Nancy met in a restroom when attending a writer’s event. For me, Doris just needed to be incarnated as a rag doll with attitude. Lastly, I’ll give a a sneak peek at the pieces that i’m putting together for my upcoming featured artist show in March. Titled, ” Rock, Paper, Scissors”, I will represent the “paper” in the trio of artist. 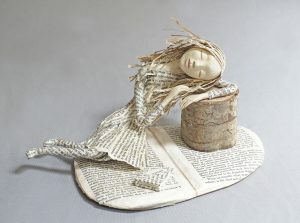 The art doll sculptures I am creating for this show have paper as their primary media and inspiration. The first of these pieces is Prudence. 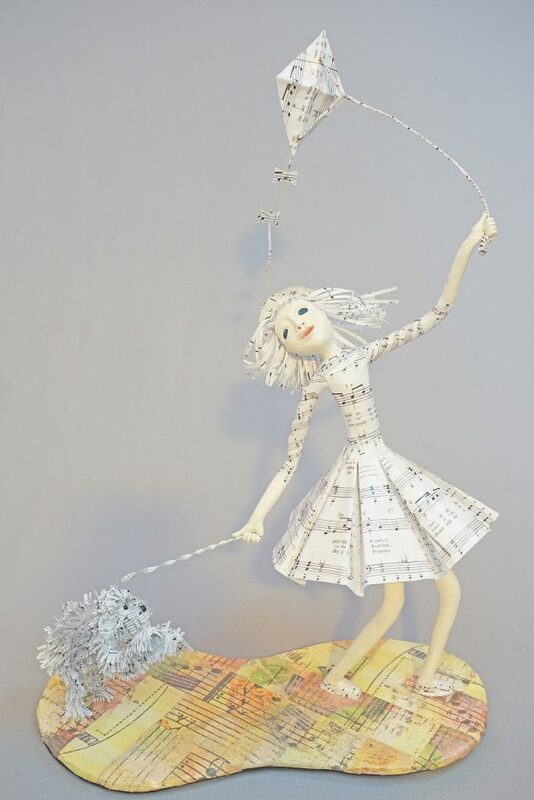 Prudence is based on the Beatles’ “Dear Prudence”, and as you can see, she has “come out to play.” She is accompanied by her sheep dog (Martha, my dear?) and they are running across a musical landscape flying a kite. 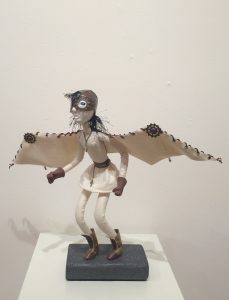 This entry was posted in Art Dolls, Art Shows and tagged art doll, Art doll show, Art show, figure, figure sculpture, Hillsborough Gallery, mixed media, one of a kind, sculpture, the Hillsborough Gallery of Arts on January 19, 2018 by lynnadmin. My featured artist show, Up Close, at the Hillsborough Gallery of Arts will be coming down next Monday, the 24th of July. I know there is street construction all along the gallery’s storefront, but there is still access all along the sidewalk closest to the buildings. 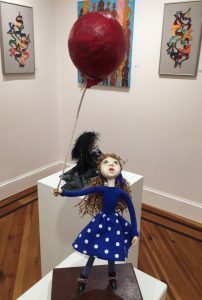 Many of my newest art doll sculptures will still be around HGA after the show closes, as they are incorporated into the gallery collection throughout the rest of the space. So, your favorite may still be here. 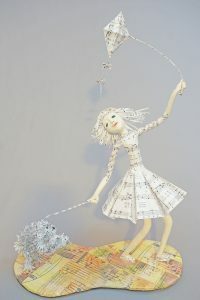 I titled my latest sculpture doll “Local Star.” Star is a papier-mâché and paperclay figure over a wire armature. 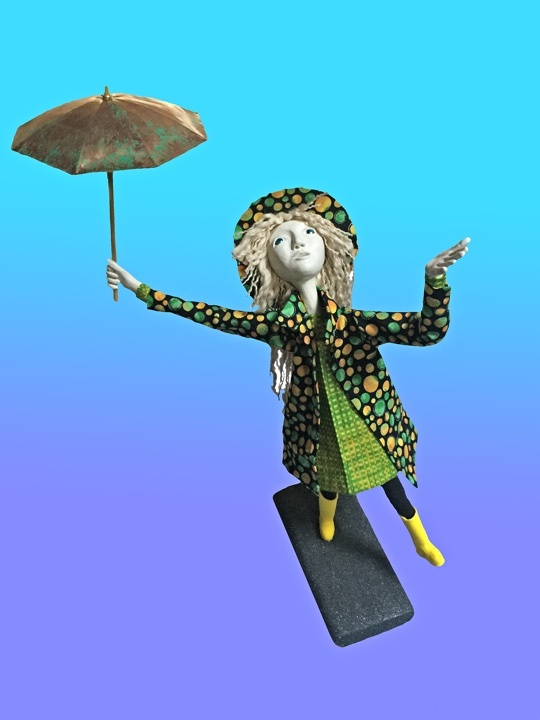 I focus on the elements of movement and surface in this art doll piece. Local Star is modeled after Degas’s 1876 painting “The Star”. 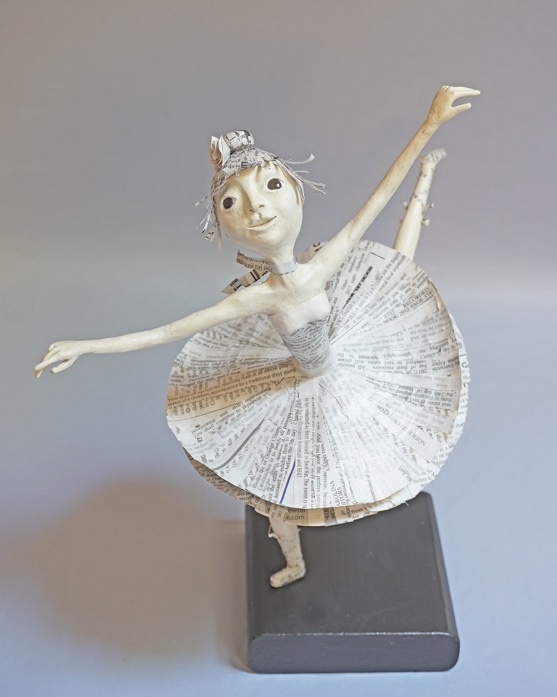 My Star is a slightly caricatured ballet dancer figure trying to emulate the Degas painting. Her unique costume and wigging are created from the pages of the local news paper. I play here a bit with the idea of the hometown dance/music/art studio, and the local mistress or master instructing all of their own little “local stars”. They may or may not go on to be true stars, but they certainly are in someone’s eyes. The local paper is just the place that would carry the announcement of her upcoming recital or show. Star’s eyes are torch fired enamel. The paperclay’s “antiqued” surface tone was created with a tea dye. All the sculpture’s paper and paperclay surfaces are sealed with decoupage medium. 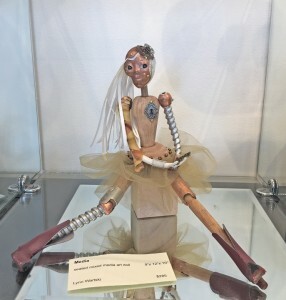 This entry was posted in Uncategorized and tagged art doll, Art doll show, ballet, dancer, degas, figure, figure sculpture, Hillsborough Gallery, Local Star, mixed media, one of a kind, sculpture, the Hillsborough Gallery of Arts, The Star on July 19, 2017 by lynnadmin. 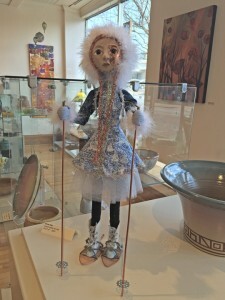 I snapped a few iPhone images of my newest art doll figure sculptures after installing the show Monday at the Hillsborough Gallery of Arts. The show’s opening reception is this Friday from 6-9pm during Hillsborough’s Last Friday Art Walk. I, personally will not be in attandance at the opening, but please stop by and visit my newest work if you are in town. If, however, you are also not around Hillsborough… Here’s a peek. 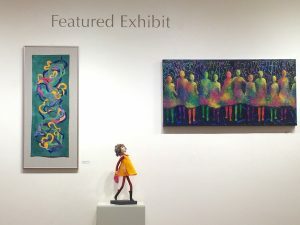 A look through the door to the Featured Artist Gallery shows my work along with painting by Linda Carmel, and textile art by Alice Levinson. Walden Nap looks peaceful on a solitary pedestal in the center of the FA gallery. New sculpture, Polly, inspired by a visit to a small pond with a healthy population of tadpoles. A new look at an earlier piece “Wednesday’s Child”, based on the well known nursery rhyme. March is walking with a purpose. Balloon Too wonder and movement in a moment captured from childhood. My Athena in full battle gear to fight ignorance. Giving Wing was created for a show earlier this year, and fit in well with my other new pieces. Hope you get a chance to stop by. 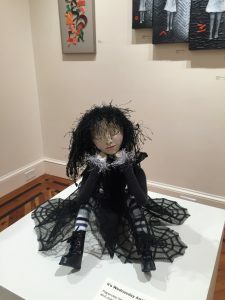 This entry was posted in Art Dolls, Art Shows and tagged art, art doll, Art doll show, Art show, figure, figure sculpture, Hillsborough Gallery, mixed media, one of a kind, OOAK, opening reception, sculpture, the Hillsborough Gallery of Arts on June 29, 2017 by lynnadmin. Up Close, is the title of my featured artist show with painter Linda Carmel and textile artist Alice Levinson. 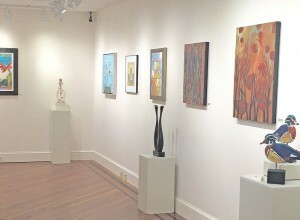 The show will open later this month at The Hillsborough Gallery of Arts. The art doll sculptures that I have been sharing in my most recent posts will be included in this new show. 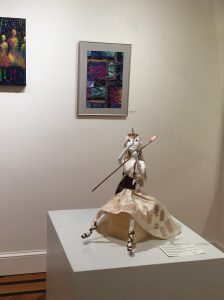 Up Close runs June 26th through July 23rd, with an opening reception on June 30th from 6-9pm during Hillsborough’s “Last Friday” art walk event. I admit that I tend to horde my newest pieces as I approach each year’s featured show. Several new figures are in the studio awaiting installation the last week of June. I took the opportunity to photograph a few more this week. I quite literally (or is that literature-ly?) pulled this art doll from the pages of Thoreau’s writings. 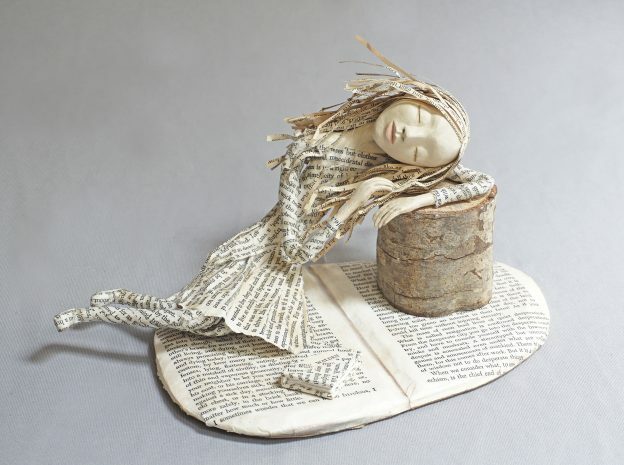 My serenely napping figure is sculpted out of paperclay and papier-mâché. I photocopied pages containing favorite passages for the surfaces of the sculpture and the art doll’s hair. 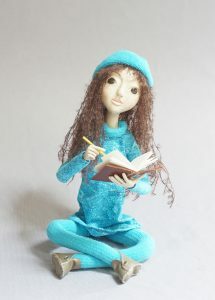 This magical art doll figure is creating some type of magic from the fibers in her hands. This figure sculpture is unnamed at the moment. Something along the lines of Dream Weaver seems a bit too easy. Her hands and face are sculpted from paperclay. The body is a padded wire armature with clothing sewn in place. 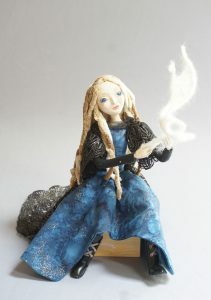 I played a bit with needle felting some wool fiber to create her rising magic over a wire frame. Her “dreadlocks” are made from a thick blanket yarn. I shared a “selfie” of Sketch in my last post. 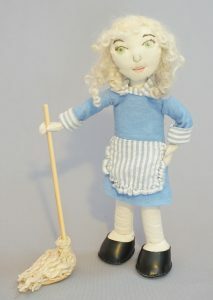 Here you see the completed art doll. I have several past reading and writing figures in my portfolio, but I think this is the first that is specifically drawing in her sketch book. 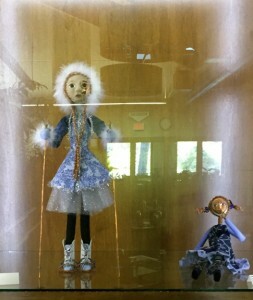 These art dolls and a few others will be in the Hillsborough Gallery of Arts starting June 26th. 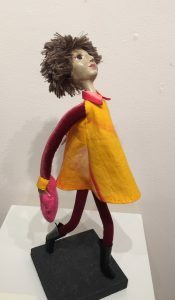 This entry was posted in Art Dolls, Art Shows and tagged art doll, Art doll show, Art show, figure, figure sculpture, Hillsborough Gallery, mixed media, one of a kind, OOAK, opening reception, sculpture, the Hillsborough Gallery of Arts on June 10, 2017 by lynnadmin. Go Figure! 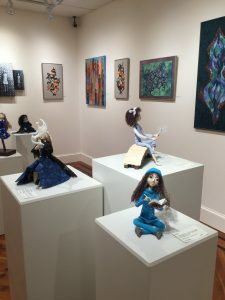 Is the title of the show at the Hillsborough Gallery of Arts featuring new work by painters Linda Carmel, and Marcy Lansman, and art doll sculptures by yours truly. The show installed Monday, and the opening reception is this Friday, September 30th, from 6 to 9 pm during Hillsborough’s monthly “Last Friday” art walk. All three of the artists featured this month’s show highlight figures in our current work. I took a few shots with my phone after we had the show all installed Monday as a preview for you. Marcy’s vibrant pantings feature family and children, many are adapted from her own family photos. 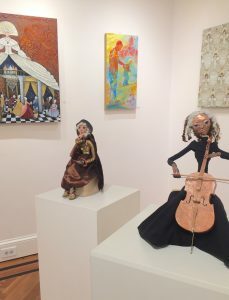 Linda’s highly textured paintings are over sculpted modeling paste, they depict female figures with connections to roles and image. With my own pieces, I wanted to push gesture and form of each sculpture to bring my art dolls to where they invoke a narrative for the viewer. I noticed after we had installed the show that many now appear to look like book illustrations to me. 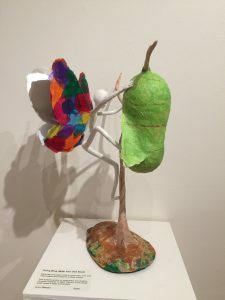 I think that can be said of the work of all three of this month’s featured artists, and it provides a nice connection between our work beyond their merely being figurative works. As I wrote earlier, the opening reception for “Go Figure!” is this Friday from 6 to 9pm. We hope that you can come out and get a closer look at all of our work. 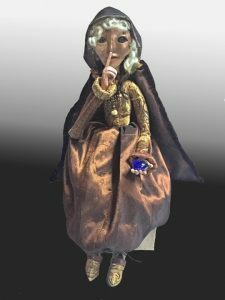 This entry was posted in Uncategorized and tagged art doll, Art doll show, Art show, figure, figure sculpture, Hillsborough Gallery, mixed media, one of a kind, OOAK, opening reception, sculpture, steampunk, the Hillsborough Gallery of Arts on September 28, 2016 by lynnadmin. 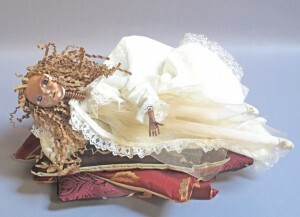 The latest art doll in my series of fairytale inspired sculptures is based on the tale of the Princess and the Pea. 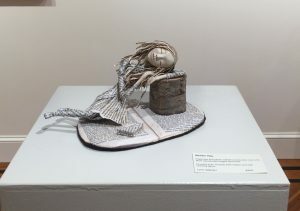 This doll I have simply titled, “…And The Pea”, and she is currently reclining on display at The Hillsborough Gallery of Arts. …And The Pea is perched on top of the last four of her hundreds of mattresses. 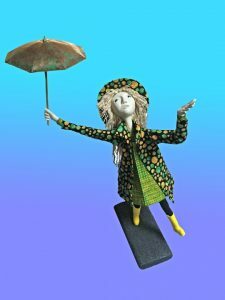 I chose to return to hammered copper features and hands for this art doll to contrast with her other overly cushiony and fabric elements. The sculpture holds the source of her nocturnal discomfort in her hand for the viewer to see. The pea in this piece is a shiny green glass bead. …And The Pea’s wonderfully touseled “bead head” is made from crinkly paper packing material, and she has bright blue torch fired enamel eyes. This morning I installed a show in the 3D display at the Carol Woods retirement community in Chapel Hill. Each month, the members of the community’s Arts Interest group invite a pair of artists to show in their beautiful community center. I do apologize for the image quality, but there really wasn’t any combination of lights on or lights off that would allow you to see the figures in the case while also eliminating glare on the glass. There are three sections to the display, and it currently houses 10 of my sculptures and art dolls. 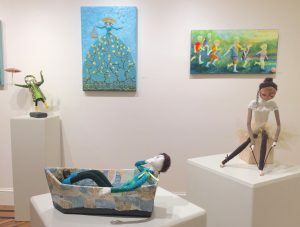 Tomorrow evening there will be a small reception at 4:30, and a 15 minute presentation by each artist in the media room, followed by dinner with the Art Interests group. More new work on the way next week, but in the meantime, I need to go and finish up creating my slide show for tomorrow night’s presentation. If you are in the Chapel Hill area tomorrow, please feel free to show up for the show’s opening reception. 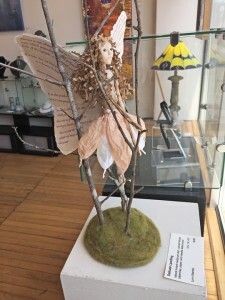 This entry was posted in Art Dolls, Art Shows and tagged art doll, Art doll show, copper, fairytale, figure, figure sculpture, Hillsborough Gallery, mixed media, one of a kind, OOAK, opening reception, sculpture, steampunk, the Hillsborough Gallery of Arts on October 22, 2015 by lynnadmin.